For the past two weeks Moldovans have been out in the streets, protesting. The organizers of the rallies – several politicians who have joined the Committee to Defend the Constitution and Democracy – are demanding the resignation of the government and early elections. The rallies were triggered by the announced decision of the authorities to hold a referendum in mid-spring on amending the constitution in an attempt to make it possible to elect the Moldovan president by a simple parliamentary majority. The country has not had a president since 2009. Several previous attempts by the parliament to elect a leader have failed, resulting twice in early elections and an unsuccessful referendum. While more protests have been announced to take place every weekend in the coming months and to be supported by the former ruling Communist party, and despite the overall dissatisfaction within the society with the ruling alliance and its inability to elect the head of state, the current anti-government protests have received very little endorsement from Moldova's online community. The Facebook group ‘Down with the oligarchs’ government!,’ created by the protest organizers, hasn't managed to reach even 300 supporters, and several people have written on the wall with the request not to be invited to the protests. 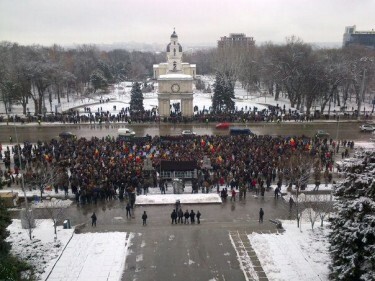 The first day of the protests in Chisinau, Moldova – January 22, 2012. Photo by blogger Eugen Luchianiuc, http://luchianiuc.com/blog/, used with permission. DO NOT WRITE ANYTHING ANYMORE! They do not mean anything to us, let’s demonstrate this to them by not commenting and by not paying attention to them anymore. Netizens seem to have their well-grounded reasons to stay aside from the ongoing protests, and their arguments have nothing to do with the yellow-code alert of cold temperature of up to -20°C these days in Moldova’s capital. Oh well, I have reached the end of my patience and the one to blame is: that bearded face which we have all seen these days on TV: Rosca – this hypocrite, for whom at the age of 12 I used to go out every day in the rain and wind to fight for a country without communism. Now, this man is disturbing my ears with his pathetic discourses in the main square about how well he licks the communists’ bottoms, at the masquerade someone called “big protests”! Yes! People have the right to be dissatisfied – things are going crazy in our politics and life! Yes! People are right to go out and protest! But not at the appeal of a communist flatterer, without any verticality… How would Rosca be able to gather 2,000 people in the streets (and those being Russian speakers)? This makes one doubt even gravitation on earth. Seriously, Rosca would not be able to convince even 3 giraffes to come to the protests! The current government has long exceeded its legal mandate offered by the people, has parasitized all state institution and during three years, under the cover of the pro-European slogans, has controlled all fluxes of money entering the Republic of Moldova. These are the reasons for which the alliance has to leave the power.